We use a billboard – the symbol of the modern age consumption – and change it into an object of consideration, reflection and a deep insight into ourselves and the surrounding reality. The project was launched by Galeria Rusz in November 2018 for the 100th anniversary of Polish independence. 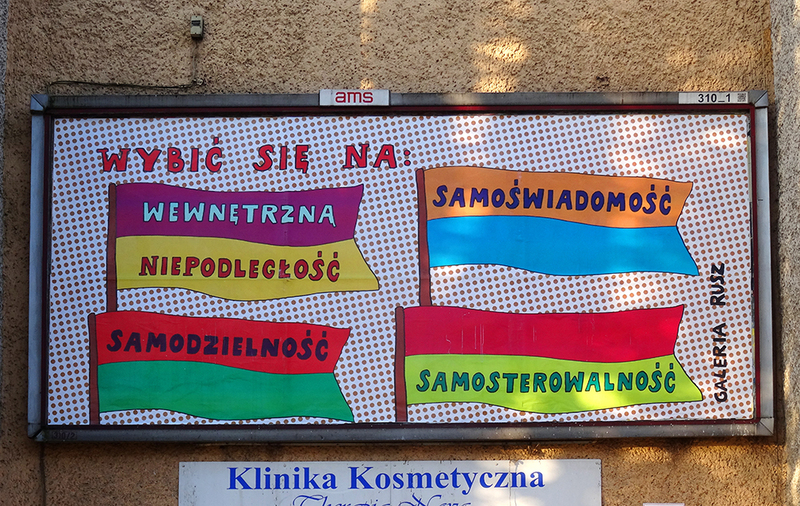 The artists’ works were displayed in Toruń, on one of the buses driving around the entire city and on billboards, as well as in Warsaw, on 3 billboards. The artists emphasized in these works how important Poland regaining independence was for us contemporary Poles, as in our everyday lives we had forgotten about it and do not appreciate the fact that we live in a free and independent country. The artists from Toruń also paid attention to the essential fact that the country can develop better and more fruitfully if an emphasis is placed on the individual growth of particular members of society. The works by Joanna Górska and Rafał Góralski focused on the individual growth that is essential for the growth and success of the local community and, consequently, of the entire country. By means of their works, the artists invited people to reflect on inner independence, and encouraged them into individual growth, as these are the individuals who have a direct impact on whether our society will grow successfully and build a common positive future.